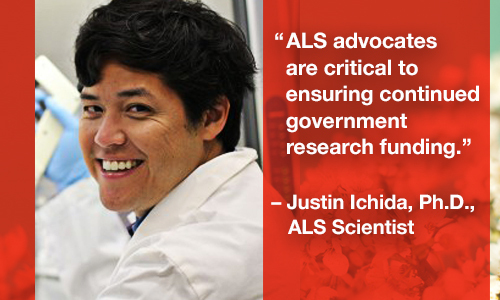 Justin Ichida, Ph.D. is an ALS researcher at the University of Southern California. Dr. Ichida is working to discover targets for drug therapy, specifically around the C9orf72 gene mutation, which is one of the leading known causes of familial (inherited) ALS. Thanks to the unrelenting advocacy of the ALS community, Dr. Ichida was recently able to apply for federal funding from the Department of Defense’s ALS Research Program (ALSRP), which was originally created, in part, due to the alarming statistic that military veterans are twice as likely as their civilian counterparts to be diagnosed with ALS. Under the leadership of Lucie Brujin, Ph.D., MBA, Chair Emeritus of the ALSRP and Chief Scientist at The ALS Association, the ALSRP is invaluable to the scientific community and ensures that those of us studying ALS are working together instead of duplicating efforts, as in the past. This is accelerating us toward a clear understanding of the complexities of ALS. ALS advocates are critical to enduring continued government research funding. During ALS Awareness Month, you can make an impact by lending your voice to this important cause. People affected by ALS are counting on you!